This name is a derivation either of the Middle English job descriptive 'Haggart' or 'Haggerter' meaning 'a trainer of wild hawks' - ones caught in the wild rather than raised in captivity. The second possible derivation is from the Olde Danish 'Agard', a locational name from the city of Agard in Denmark and the name of the famous English writer Sir H.Ridar Haggard. 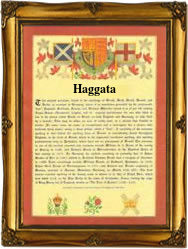 Despite its 'foreign' appearance we believe that Haggata is an East Anglian corruption of what is essentially a West Country name, and first recorded as Haggart C.1679, Somerset. The first recorded spelling of the family name is shown to be that of Alice Haggard which was dated 1275 The Pipe Rolls of Worcester during the reign of King Edward 1 the Hammer of the Scots 1272-1307 Surnames became necessary when governments introduced personal taxation. In England this was known as Poll Tax. Throughout the centuries, surnames in every country have continued to "develop" often leading to astonishing variants of the original spelling.